Before you email us, please read these FAQs. The information you need may be there. If not, contact us below with your question and we will respond soon. Is it possible to have a music career? Even if I'm a beginner? Yes, it is possible. Everybody starts as a beginner, so that isn’t the problem. The problem isn’t talent, money or fame. The biggest problem most emerging musicians face is Not Having a Blueprint. How can you get anywhere if you don’t know (1) where you are, (2) where you’re going and (3) what to do next. You get excited, go into Home Depot and start buying stuff… windows, doors, sinks, toilets, paint, wood, nails, screws, shingles and electrical cable. Wow – that was fun! Now what? How do you put it all together? What happens first? Then what? Who can you ask? What kind of house could you build without a blueprint? A disaster! Unfortunately, that’s how many artists treat their music careers. It’s guaranteed to fail. Instead, get great advice, and create a solid blueprint to achieve your musical dreams. You can do it! What makes MUSICIAN IGNITION different from other music career books? Good question! I wrote MUSICIAN IGNITION with my daughters in mind. Literally, I wanted to share with them the strategies I have learned that work. Like any parent, I want them to succeed. I would never give them silly or trendy advice to steer them wrong. Instead, I hope to empower them with tools and information needed to accomplish their goals. I want them to succeed at whatever they do, (of course), but especially in the arts. I have spent my entire life as a musician. That’s all I’ve done for income. The lessons you learn in MUSICIAN IGNITION are from real-life experiences. I want musicians to become their best. And then take that skill into the marketplace and get paid well for it… not free beer and exposure. That’s the difference. MUSICIAN IGNITION comes from real life. I want you to succeed at music and at life. If it has worked for me and other successful musicians – it can work for you! Will MUSICIAN IGNITION help me get a recording contract? Yes and No. Maybe. It’s possible. Sometimes. Can MUSICIAN IGNITION help you get ready. Absolutely! If you’re willing to do the work. Any advice for building a music career? Yes! Buy this book. It may be the best investment you’ll ever make. Stop hoping and dreaming and begin building your future today. You have everything you need to do the important work. Get busy! Where is my purchase information? Usually, if your purchase details are not in your inbox, you should check your spam folder. The email filters are often hard to bypass. It is probably there waiting for you. Can I get my money back if MUSICIAN IGNITION isn't what I want? Yes. We offer a solid, 60-day money back guarantee. No risk and worry free. 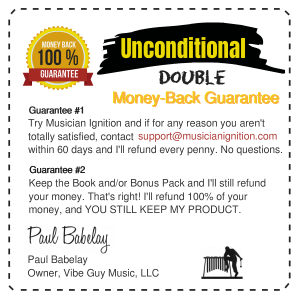 I am so confident you will love MUSICIAN IGNITION, that we give you a DOUBLE GUARANTEE. If you ask for a refund within 60 days, you get every penny back AND… you get to keep the product. Crazy? Perhaps. But if for any reason you aren’t satisfied, just send an email within 60 days of your purchase and we will refund every penny. No questions! I think that’s the best guarantee you’ll ever see. Should I purchase PDF or ePUB format? When purchasing MUSICIAN IGNITION, you have the choice to select either PDF (Portable Document Format) or ePUB (Electronic Publication). ePUB is an open Ebook file format that is optimized for viewing on multiple devices. You can adjust the font size and it automatically resizes to fit your screen. ePUB is compatible with many eReaders and reading apps, including the Kindle Fire, iPad and iPhone, Galaxy tablets and others. PDF is the most used electonic document format worldwide. But, it is not fluid or reflowable. The text size cannot be adjusted. Many people prefer PDF if they read/work on a desktop or laptop computer. If you only use an iPad or smartphone, PDF is difficult to view. Both have advantages and disadvantages. I like having a PDF on my desktop, because that’s where I work. But, I also like having an ePUB version on my phone for portability. The obvious solution? Purchase the BONUS PACK and have both. Why does it say "Vibe Guy Music" at checkout? Musician Ignition is published and licensed by Vibe Guy Music, LLC. Is Musician Ignition available in print? But, If you prefer print copies for an educational/classroom situation, we can special order it. Contact us for a quote.